Opener Thomas Lee’s unbeaten century guided Littlehampton Cricket Club to an impressive Sussex League Division 4 West victory over Broadwater in a crunch meeting on Saturday. Lee, who ended undefeated on 111, played a pivotal role as Littlehampton successfully chased down 218 to seal a two-wicket home triumph. 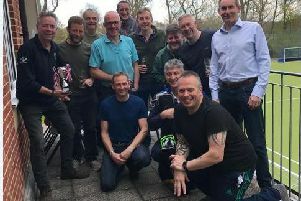 Leaders Littlehampton welcomed nearest challengers Broadwater for what they knew would be their toughest test of the season to date. Yet as they have done in every match so far this season, James Askew’s side further proved their title credentials in a thrilling encounter. Gareth Challen had earlier hit 79 to guide Broadwater to 217-7 after they chose to bat first and leave Littlehampton facing a challenging chase. Lee would provide the glue, guiding Littlehampton to victory, while fellow opener Guy Souch (39) and Louis Paul (26) made telling contributions to get their side over the line to make six wins from seven in the league so far this season. Skipper Askew said: “It was a good win in a competitive game that could have gone either way. “Tom (Lee’s) innings was outstanding and lead us from the front. He showed great maturity when many of us fell around him playing silly shots. “Broadwater are a very good team and will certainly be challenging come the end of the season. “After a few of the games have been so one-sided, I’m glad the team stayed switched on enough to come through what we knew would be a tough game and pick up 26 points. “It’s been a great first seven games, I could not have asked anymore from the team. James Askew (3-30) and Ryan Budd (4-79) were the pick of the Littlehampton bowlers as Broadwater made 217-7 off 53 overs. Broadwater were wobbling at 58-3 but Gareth Challen (79) lead the fightback. Middle order batters Les Ward (36) and Jame Iago (29) did their bit to get Broadwater up to a defendable total. Centurion Lee and opening partner Souch (39) shared an important stand of 61 for the first wicket. Wickets fell regularly following Souch’s dismissal but Lee would remain unbeaten at the other end to lead Littlehampton to victory. Paul made an important 26, while McLeod Cox weighed in with 18 to edge the home side closer to the winning line. Lee (111*) would remain until the end and Nathan Perry (four not out) was the other unbeaten batsman as Littlehampton reached 221-8 with five balls to spare. Benn Challen (6-91) impressed but ended up on the losing side. Broadwater skipper Nigel Waller, whose side dropped a place to third following the defeat, felt it was a great advert for timed cricket. He said: "It was a terrific game and a great advert for timed league cricket with all four results possible with two overs left. While the result didn’t go our way, credit must go to two good teams who fought out a tremendous game of cricket in a hard, but fair, and good spirited way. "Oddly enough I don’t think either team played to their very best but it resulted in very exciting match."